Proud to be a Socialist! Brendan Sexton III, Salon (3/20/02). More on "Black Hawk Down" debate. Gravy Train: Feeding the Pentagon by Feeding Somalia. Stephen Shalom, Z Magazine (111/93). 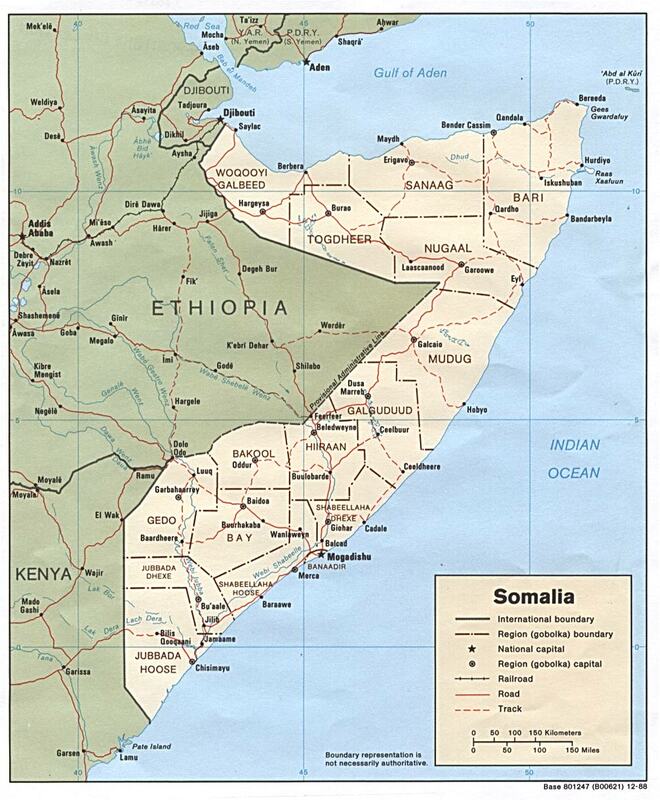 Administrative, travel & overview maps of Somalia. All Africa News Service: Somalia. UN site on developments in Somalia, with maps, photos, and databases. Somalia background, links to sites on business, culture, education, history, media & more. Journalist Michael Maren's site on Somalia & US/UN humanitarian intervention. U.S. Library of Congress comprehensive intro to country and its people. Civil War in Somalia: Background and brief synopsis of major events. Somalia: Peace and Reconciliation - from Oxfam Community Aid Abroad. Besteman, Catherine. "Representing violence & othering Somalia," Cultural Anthropology 11,1 (1996):120-33. __________. "Violent politics & the politics of violence: the dissolution of the Somali nation state," American Ethnologist 23,3 (1996):579-96. Bures, Frank. "From civil war to drug war," Mother Jones (11-12/01):23-24. Somali immigrants & the khat trade. Cahill, Kevin M. "The clinical face of famine in Somalia," in ? Famine (Maryknoll NY, 1982), pp. 39-43. Cassanelli, Lee V. "Qat: changes in the pproduction & consumption of a quasilegal commodity in northeast Africa," in A. Appadurai (ed.) The Social Life of Things: Commodities in Cultural Perspective (NY: Cambridge, 1986), pp. 236-57. Clarke, W. & J. Herbst. "Somalia & the future of humanitarian intervention." Foreign Affairs 75 (3-4/96):70-. Cockburn, Andrew. "Somalia: a failed state?," National Geographic (7/02):54-60. Doornbos, M. "Somalia: alternative scenarios for political reconstruction," African Affairs 101 (1/02):93-107. Farah, Nuruddin. "Land beyond," New Yorker (10/15/01):163. Boyhood impressions of America. Makinda, S.M. "Somalia: from humanitarian intervention to military offinsive," World Today 49 (1093):184-86. Menkhaus, K. "Somalia: political order in a stateless society," Current History 97 (may 1998):220-24. Michaelson, M. "Somalia: the painful road to reconciliation," Africa Today 40 (1993):53-73. New Internationalist, special issue on Ethiopia, Eritrea, Somalia & Sudan (12/92), with articles by Richard Swift, Tony Vaux, Elsa Gebreyesus, Arthur Howes, John Galaty, Alex de Waal & Paulos Tesfagiorgis. Omaar, Rakiya. "Somalia: at war with itself," Current History 91 (5/92):230-34. __________. "Operation humiliation," New Internationalist (4/93):35. __________. "One thorn bush at a time," New Internationalist (6/94):8-10. Grassroots peace efforts. Packer, George. "Letter from Somaliland," Nation (4/22/02):21-23. Reyner, Anthony S. "Somalia: the problems of independence," Middle East Journal 14,3 (1960). Shalom, Stephen. "Gravy train: feeding the Pentagon by feeding Somalia," Z Magazine (2/93). Simons, A. "Somalia & the dissolution of the nation-state," Amer Anthropologist 96 (1994):818-24. Weil, R. "Somalia in perspective: when the saints go marching in," Monthly Review 44 (1993):1-13. Abdi, Ismail Samatar. The State & Rural Transformation in Northern Somalia, 1884-1986 (Madison WI, 1989). Abdullah, Mohamed Diriye. Fiasco in Somalia: US-UN Intervention (Pretoria, 1995). Abir, Mordechai. The Contentious Horn of Africa (London, 1972). Adam, Hussein Mohamed. Militarism & Warlordism: Rethinking the Somali Political Experience (Boston, 1993). __________. & Richard Ford. Mending Rips in the Sky: Options for Somali Communities in the 21st Century (Lawrenceville NJ, 1997). Africa Watch Committee. Somalia: A Government at War with its Own People: Testimonies about the Killings and the Conflict in the North (NY, 1990). Ahmed, Ali Jimale. Daybreak is Near: Literature, Clans, & the Nation-State in Somalia (Lawrenceville NJ, 1996). __________ (ed.) The Invention of Somalia (Lawrenceville NJ, 1995). Aman, as told to Virginia Lee Barnes & Janice Boddy. Aman: The Story of a Somali Girl (London: Bloomsbury, 1994). Gripping autobiographical account, 1953-1970, from nomadic girlhood to runaway wife & quasi-prostitute in the city. Amnesty International. Somalia: A Human Rights Disaster (NY, 1992). __________. Somalia: Update on a Disaster. Proposals for Human Rights (NY, 1993). Baez, Joan Sr. One Bowl of Porridge: Memoirs of Somalia (Santa Barbara CA, 1986). Barnes, Virginia Lee. Aman: The Story of a Somali Girl (NY, 1994). Besteman, Catherine Lowe. Unraveling Somalia: Race, Violence, & the Legacy of Slavery (Philadelphia, 1999). __________ & Lee V. Cassanelli (eds.) The Struggle for Land in Southern Somalia: The War Behind the War (Boulder, 1996). Bongartz, Maria. The Civil War in Somalia: Its Genesis & Dynamics (Uppsala, 1991). Bowden, Mark. Black Hawk Down: A Story of Modern War (NY, 1999). Bradbury, Mark. The Somali Conflict: Prospects for Peace (Oxford, 1994). Bryden, Matt. Somalia between Peace & War: Somali Women on the Eve of the 21st Century (Nairobi, 1998). Burnett, John S. Where Soldiers Fear to Tread (NY: Bantam, 2005). Memoir of relief worker during floods of 1997-98. Cabdisalaam, M. Ciisa-Salwe. The Collapse of the Somali State: The Impact of the Colonial Legacy (London, 1994). __________. Cold War Fallout: Boundary Politics & Conflict in the Horn of Africa (London, 2000). Cahill, Kevin M. Somalia: A Perspective (Albany, 1980). Cassanelli, Lee V. The Shaping of Somali Society. Reconstructing the History of a Pastoral People, 1600-1900 (Philadelphia, 1982). Clarke, Walter & Jeffrey Herbst (eds.) Learning from Somalia: The Lessens of Armed Intervention (Boulder, 1997). Cliffe, Lionel et al. Beyond Conflict in the Horn (Trenton NJ: Red Sea, 1992). DHaem, Jeanne. The Last Camel: True Stories About Somalia (Lawrenceville NJ, 1997). Dirie, Waris. Desert Flower: The Extraordinary Journey of a Desert Nomad (NY, 1998). Drysdale, John. The Somali Dispute (NY, 1964). Farer, Tom J. War Clouds on the Horn of Africa: the Widening Storm (NY, 1979). Fishel, John T. The Savage Wars of Peace: Toward a New Paradigm of Peace Operations (Boulder, 1998). Fitzgibbon, Louis. The Betrayal of the Somalis (London 1982). Ghalib, Jama Mohamed. The Cost of Dictatorship: The Somali Experience (NY, 1995). Hartley, Aidan. The Zanzibar Chest: A Story of Life, Love, & Death in Foreign Lands (Boston, MA: Atlantic Monthly, 2003). Hashim, Alice B. The Fallen State: Dissonance, Dictatorship & Death in Somalia (Lanham MD, 1997). Heinrich, Wolfgang. Building the Peace: Experiences of Collaborative Peacebuilding in Somalia, 1993-1996 (Uppsala, 1997). Hirsch, John L. Somalia & Operation Restore Hope: Reflections on Peacemaking & Peacekeeping (Washington, 1995). Hess, Robert L. Italian Colonialism in Somalia (Chicago, 1966). Hirsch, John L. & Robert B. Oakley. Somalia & Operation Restore Hope: Reflections on Peacemaking and Peacekeeping (Washington: US Institute of Peace, 1995). Hoben, Allan & others. Somalia: A Social & Institiutional Profile (Boston U. African Studies Center Working Paper SP-1; Boston, 1983). Hussein, Ali Dualeh. From Barre to Aideed: Somalia, the Agony of a Nation (Nairobi, 1994). Kapteijns, Lidwien. Women & the Crisis of Communal Identity: The Cultural Construction of Gender in Somali History (Boston, 1993). Laitin, David D. & Said S. Samatar. Somalia: Nation in Search of a State (Boulder, 1987). Laurence, Margaret. New Wind in a Dry Land (NY, 1965). Lefebvre, Jeffrey Alan. Arms for the Horn: U.S. Security Policy in Ethiopia & Somalia, 1953-1991 (Pittsburgh: U. of Pittsburgh, 1991). the Horn of Africa (NY, 1961). __________. Saints & Somalis: Popular Islam in a Clan-Based State (Laurenceville NJ, 1998). Loughran, Katheryne S. Somalia in Word & Image (Washington, 1986). Makinda, Sam. Security in the Horn of Africa: An Analysis of Post Cold-War Developments in Regional Security & Emerging Strategic Issues in Ethiopia, Somalia, Sudan & Djibouti (London: International Institute for Strategic Studies, 1992). __________. Seeking Peace from Chaos: Humanitarian Intervention in Somalia (Boulder, 1993). Minority Rights Group. War: The Impact on Minority & Indigenous Children (London, 1997). Mohamed, Abdi-Nur Hagi. Anatomy of a Failure: Causes & Consequences of the Somalia Tragedy (Mogadishu?, 1999). Mubarak, Jamil Abdalla. From Bad Policy to Chaos in Somalia: How an Economy Fell Apart (Westport CT, 1996). Omar, Mohamed Osman. The Road to Zero: Somalias Self-Destsruction. Personal Reminiscences (London, 1992). __________. Somalia: A Nation Driven to Despair. A Case of Leadership Failure (New Delhi, 1996). Peterson, Scott. Me Against My Brother: At War in Somalia, Sudan, & Rwanda: A Journalist Reports from the Battlefields of Africa (NY, 2000). Prendergast, John. Peace, Development, & People of the Horn of Africa (Washington: Center of Concern, 1992). __________. The Bones of Our Children Are Not Yet Buried: The Looming Spectre of Famine & Massive Human Rights Abuse in Somalia (?, 1994)..
__________ Crisis Response: Humanitarian Band-Aids in Sudan & Somalia (Chicago, 1997). Press, Robert M. The New Africa: Dispatches from a Changing Continent (Gainesville, 1999). Putman, Diana Briton. The Somalis: Their History & Culture (Washington, 1993). Robinson, Mary. A Voice for Somalia (Dublin, 1992). Sahnoun, Mohamed. Somalia: The Missed Opportunities (Washington, 1994). Samatar, Ahmed I. Socialist Somalia: Rhetoric & Reality (London, 1988). __________. Somalia: A Nation in Turmoil (London, 1991). __________ (ed.) The Somali Challenge: From Catastrophe to Renewal? (Boulder, 1994). Schofield, James. Silent over Africa: Stories of War & Genocide (NY, 1996). Simons, Anna. Networks of Dissolution: Somalia Undone (Boulder, 1995). Stanton, Martin. Somalia on Five Dollars a Day: A Soldiers Story (Novato CA, 2001). Teutsch, Friederike. Collapsing Expectation: National Identity & Disintegration of the State in Somalia (Edinburgh, 1999). Touval, Saadia. Somali Nationalism: International Politics & the Drive for Unity in the Horn of Africa (Cambridge MA, 1963). Tripodi, Paolo. The Colonial Legacy in Somalia: Rome & Mogadishu, from Colonial Administration to Operation Restore Hope (NY, 1999). Farah, Nuruddin. From a Crooked Rib (London, 1970). _____________. A Naked Needle (London, 1976). _____________. Sweet & Sour Milk: Variations on the Theme of an African Dictatorship (St. Paul MN: Graywolf, 1979). _____________. Sardines: Variations on the Theme of an African Dictatorship (St. Paul MN: Graywolf, 1981). _____________. Close Sesame: Variations on the Theme of an African Dictatorship (St. Paul MN: Graywolf, 1983). __________. Secrets (NY, 1998). Love story set against backdrop of Somalias devastating civil war. ____________. Yesterday, Tomorrow: Voices from the Somali Diaspora (NY, 2000). __________. Links (NY: Riverhead, 2004).
" Black Hawk Down," dir. Ridley Scott (2001). Object of a nationwide boycott effort, provoked by its glorification of US military intervention & its blatantly racist portrayal of Somalis. "Fire Eyes" [1994? ], dir. Soraya Mire. Somali film-maker's study of the practice of the genital mutilation of girls in Somali culure.